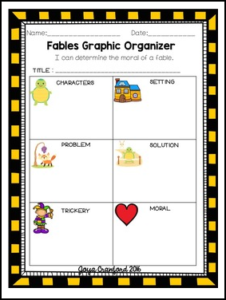 Looking for an effective common core aligned fables graphic organizer for your students? These graphic organizers help students determine the parts of a fable as well as the moral or central message. Students can write and/or draw in the boxes. Looking for similar resources? Try these! FRY Words KABOOM! Bundle (Words 1-400). Sub Plans: The Pigeon Needs a Bath!. Long Vowel vs. Short Vowel Word Sorts.